A key requirement for my floating lab/studio was to have a digital piano aboard, but limited space dictates a deployment system that lets it stow away when not in use. I designed the console around this, and built a piano drawer that can handle a quarter-ton. 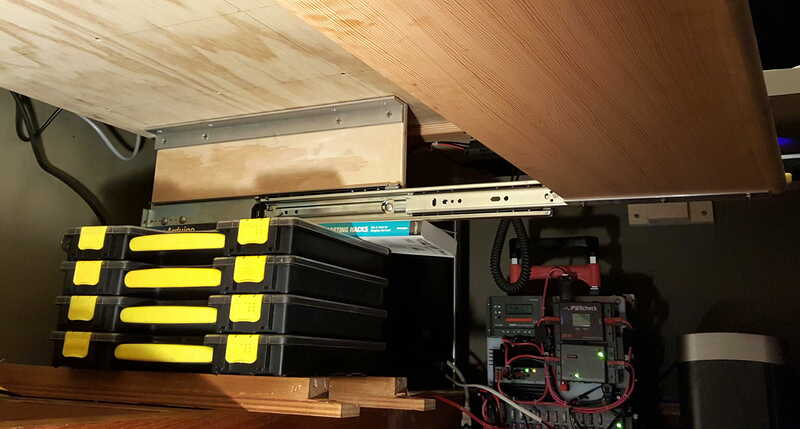 It was important that the drawer not interfere with other uses of the desk… electronics lab, writing, ham shack, video production, and software development. This dictated maximum knee clearance to keep the workspace comfortable, and when retracted, it effectively disappears. 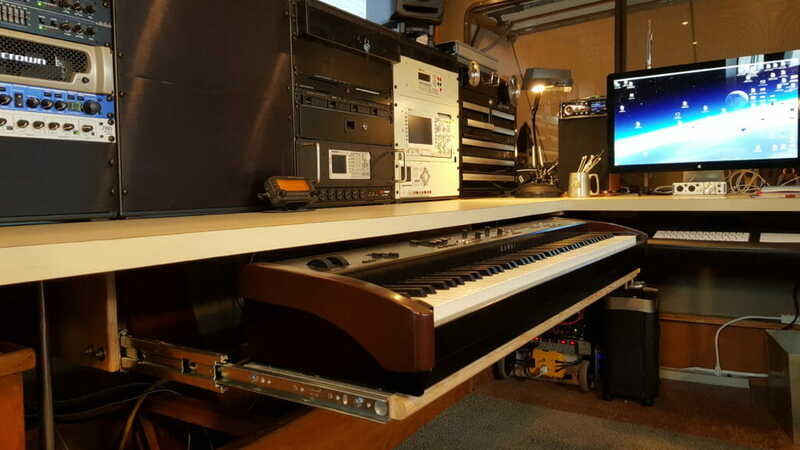 Extended, the piano dominates the space, and the computer keyboard is also on a pull-out drawer so they can be used at the same time. Any project like this is highly implementation-specific; this article includes the details of my own solution, but it was designed with very tight tolerances to make maximum use of available space. If you clone this for a different keyboard, you’ll probably want to tweak the dimensions. 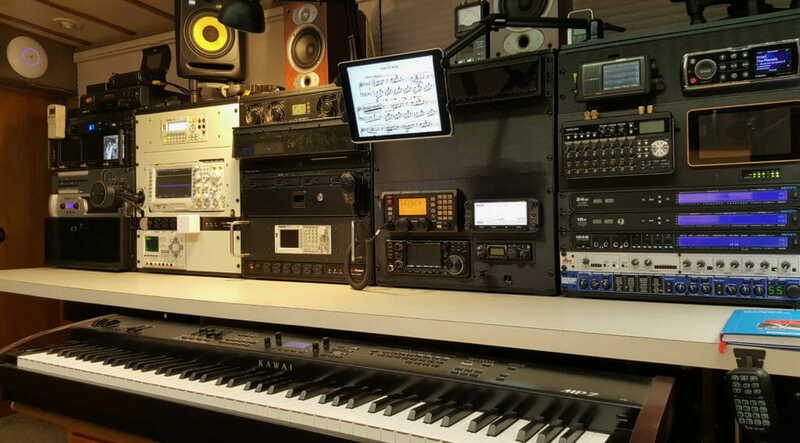 My digital piano in the photo above is a Kawai MP7, which weighs 46 pounds (21 kg) and is a bit bulky at 53 ¼” W x 13 ⅓” D x 6 ¾” H (1352 x 339 x 171 mm). I do love this thing, but it sure looked huge when I hauled it aboard and stared at it! While placing that order, I picked up four feet of 1.5 x 1.5 aluminum angle with ¼” thickness, which was another $36. This was to become the bracketry that hangs the vertical walls from the desktop, and would be my primary defense against annoying side-to-side wobble… while supporting the fastener loads of a body hitting the extended drawer at full extension (my rule on any boat is that everything must be able to handle dynamic body weight). For the shelf, I chose fir stair tread 1″ thick (5/4″ in lumber industry parlance), a foot deep with a bullnose front edge. This was annoying at $13/foot for a flawed piece on this island, but it was important that it be able to take screws into the ends. Even at that, I worried about the weak link in the whole system being end grain fastening, so I dug up some heavy 1″ aluminum channel to encapsulate this high-load region, then attached it with ¼-20 flathead screws before driving ¼” lag screws into the ends. 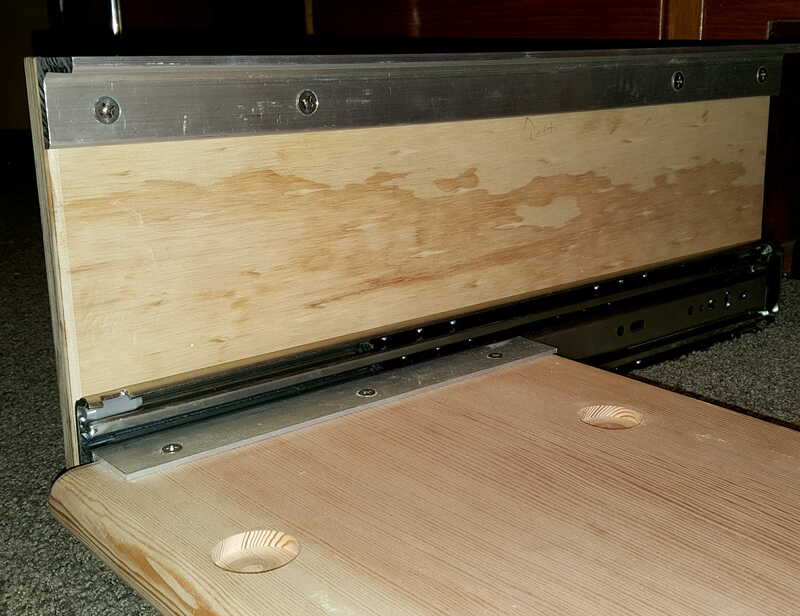 The drawer slides are supported by vertical walls of ¾” plywood, 22″ long and 8½” tall, attached to the side walls by stainless carriage bolts. The overall design of this is simple, though my obsession with tight tolerances made for some tricky details. 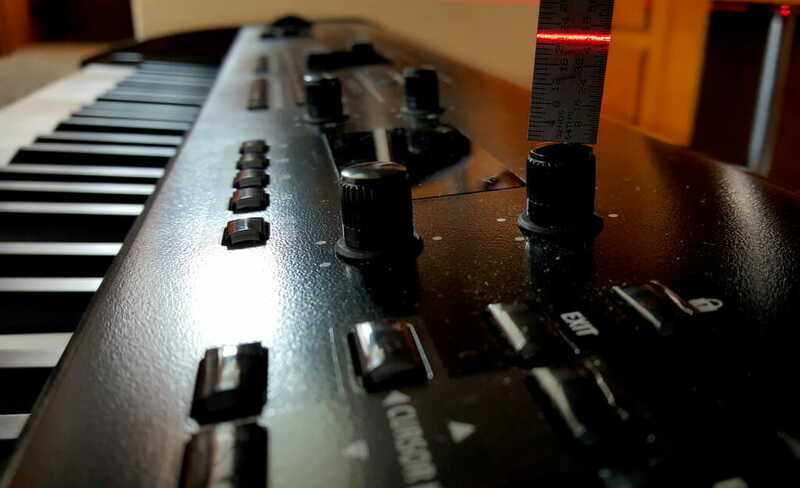 I spent an inordinate amount of time measuring the piano, which is always fun on a curvy thing with bits sticking out here and there… as bad as a boat! The worst offender is the group of knobs around the display, which are the tallest part of the machine. I had to be sure that these would not get broken the first time I closed the piano drawer, so lacking a long dependable straight-edge aboard, I used a laser level to establish a reference. The resulting data let me shorten the original side walls by a half inch. 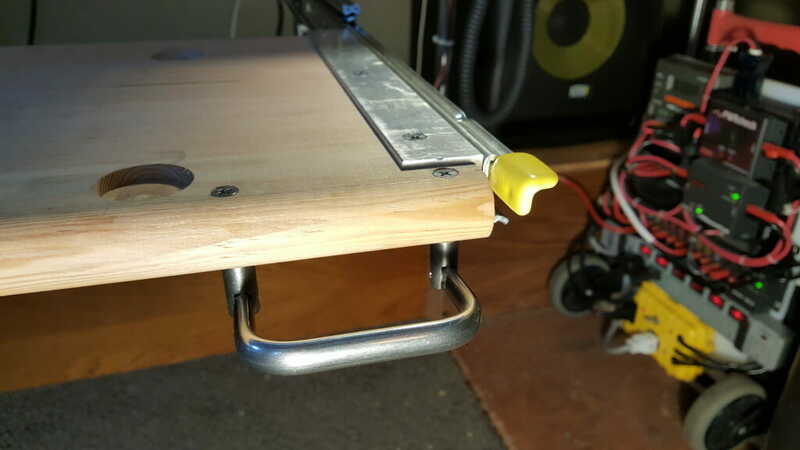 With the wood parts cut, the next task was to use that heavy angle I mentioned earlier… this is what makes the connection from the walls to the underside of the desk. 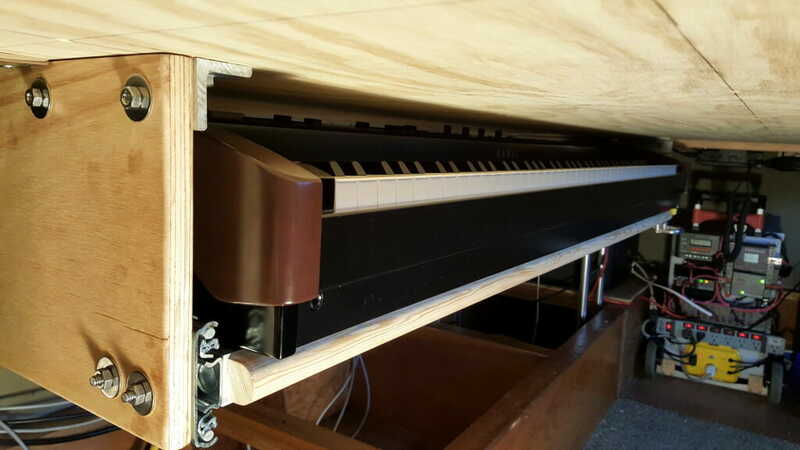 In both cases, fastener dimensions were critical to allow the piano to fit as tightly as possible, since I was constrained by the existing stainless posts (and their end fittings) that I had used to build the desk structure. I prepped two 22″ chunks of angle with countersunk ¼” holes for the walls, and 3/8″ holes for lag screws up into the 1½” desktop. So now I had this heavy contraption taking up the middle of the lab space, with the piano occupying the easy chair. Even the cat was getting irritated at the disruption of normal life and the blockage of doorways, so it was time to hang the monster! There is a messy part of every project, and this was it… with too much crawling around painfully, grunting and cursing, measuring, squaring, and fine-tuning. To hold it in place I stacked Stanley organizers under both ends with bits of wood and books, then went through a few iterations of marking. By the way, another favorite tool came in handy here… the Milwaukee Right-Angle Drive. This thing is a life-saver in tight quarters, and saw lots of action during the desk installation when I had to drill holes in place for rail fittings (always while contorted in a hopelessly awkward position). 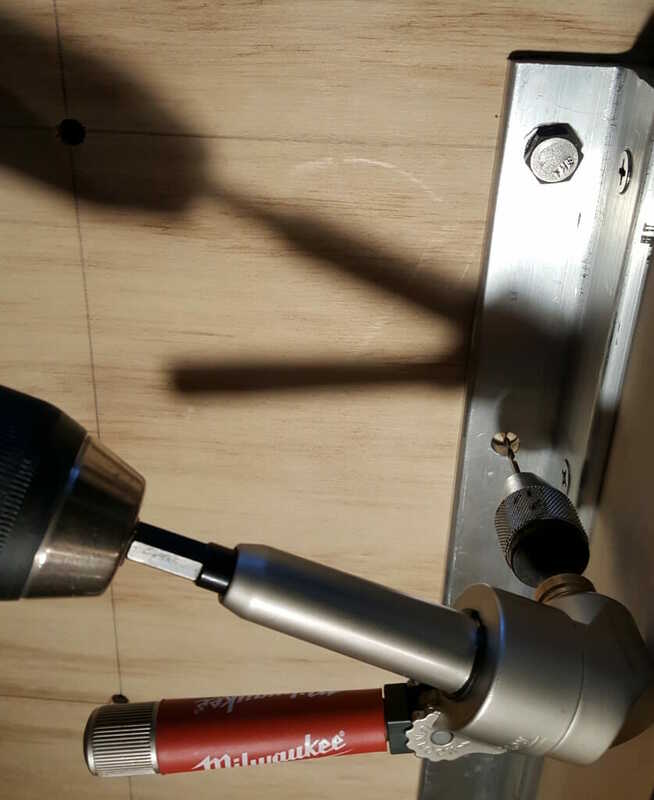 Here, I’m using a little baby chuck to drill a pilot hole after first locating it with a transfer punch to make sure it is centered. 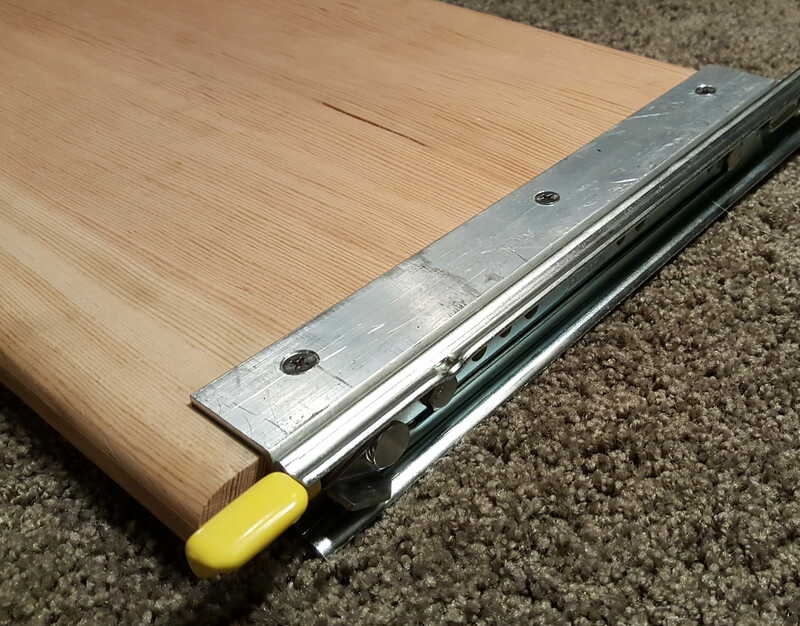 The user interface was an important issue to consider, so I added a folding stainless handle at the right end, right next to the thumb-release for the lock that keeps the drawer open or closed. This involved making a quick jig to ensure a straight hole through the 1″ shelf (an easy mistake to make) and then countersinking for #10-32 flatheads. So now we can step back and see this whole thing in context. There’s a lot more about the boat herself in a recent post (Meet Datawake), but here is the current state of the lab/studio space. I’ve just added HDPE top panels for the console cabinets, and the monitors are currently just sitting on the IsoAcoustic stands… about to be fixtured in place with Southco rubber draw latches lest they become expensive wrecking balls someday. 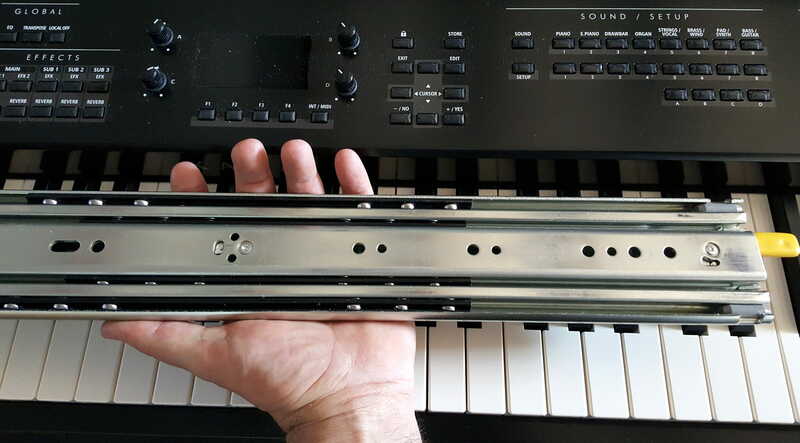 I have only two complaints… the key tops are a bit low at 27½ inches and my knees touch the support shelf when I’m playing. 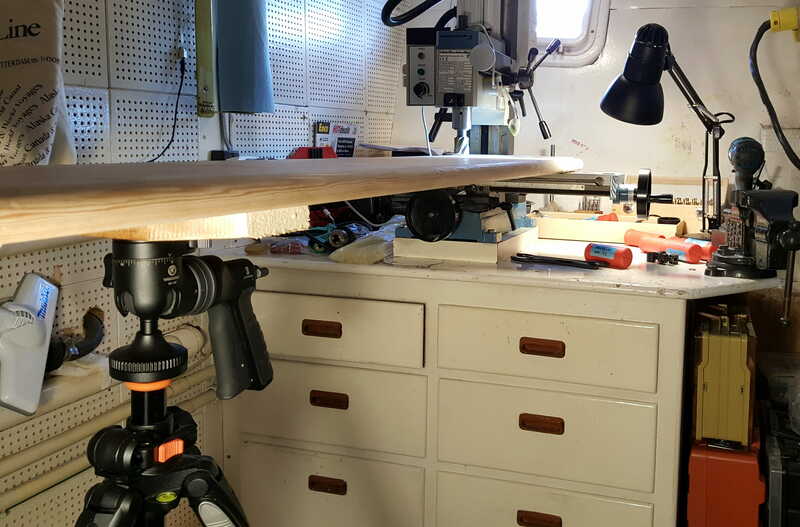 I can’t do anything about the height (the 32″ desktop is 1½ ” thick), but I think I’m going to cut a little knee relief under the center of the piano and then try to match that bullnose edge with the router even though nobody will ever see it besides Isabelle the cat. 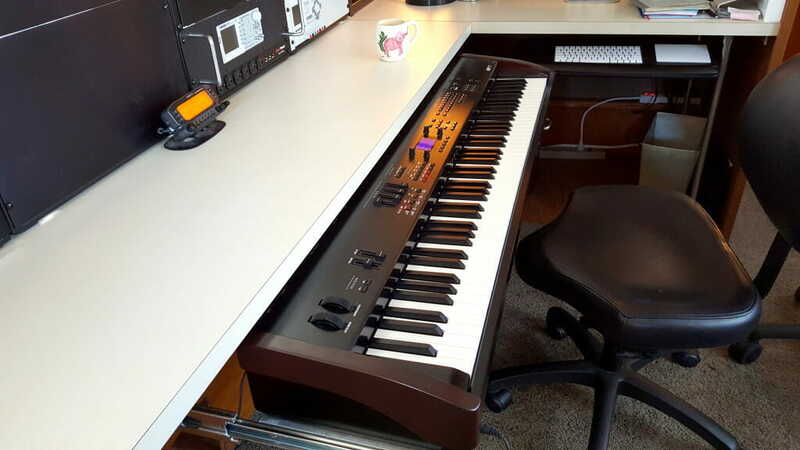 Also, I can’t use the music stand that came with the Kawai since it mounts on the back of the piano, so have restored the Manhasset 5301 to its original configuration since my modification for the PX-5S three years ago… and it is a loose item that has to be stowed.